Your step-by-step guide for planning, creating, and promoting pillar pages. SEO has evolved, and pillar pages created from topic clusters are the way to rank for the core services you offer. Search engines now identify searcher intent. They look for pages with lots of links about the intended topic. Creating clusters of topics that link to a comprehensive pillar page that provide in-depth coverage of a topic signals search engines that you are an authority on that topic. How does this all work, and how can you build pillar pages? This page is your comprehensive resource for planning, creating, promoting, and measure pillar pages to boost SEO. Keep scrolling or click a link below to jump to a chapter you're interested in. CHAPTER 2: WHAT ARE PILLAR PAGES? The idea of pillar content has been around for a while, but it started gaining more conversation in May of 2017 when HubSpot started releasing content about Topic Clusters and pillar pages. HubSpot was rocking the SEO world based on their research of how to improve SEO rank for specific topics. The assertion they made was a seismic shift away from keywords to a new model of grouping related topics (topic clusters) and linking to all of the topics from a single page (pillar pages) to help brands improve SEO rank for the products and services they offer. SEO is now more important than ever, and pillar pages are the way to rank! While HubSpot has been on the cutting edge of identifying and evangelizing this strategy, this shift, they aren’t the only ones. Neil Patel recently published an article explaining how pillar pages can improve SEO rank. The benefits of this strategy aren’t limited to HubSpot user. All brands should be modernizing their approach to SEO with this strategy. In 2013, the Hummingbird update to Google search started parsing phrases rather than specific search queries. Then, with their 2015 Rankbrain update, Google machine learning artificial intelligence (AI) began interpreting searcher intent based on things like associated past searches, search history, and similar search themes. These changes were made to provide more relevant search results based on how searchers had evolved. To address this, Hubspot recommends moving to the topic clusters where a single pillar page acts as a comprehensive page for a core topic. Within the pillar page are links to multiple content pages that are related to that same topic. The topics in the topic cluster link back to the pillar page and each other. This linking action signals to search engines that the pillar page is an authority on the topic. This strategy also informs your site’s content organization. We’ll discuss that later. A resource pillar page. This page organizes links to internal and external links on a core topic into sections that are easy to navigate. They create a helpful resource on a given topic by linking to the most relevant content. An example of this is Helpscout’s custom acquisition pillar page. This type of pillar page improves SEO, even though many of the links may send people off your site which is not optimal for your business. You can generate inbound links from the sources you include on the page. A 10x content pillar page. This is the more common type of pillar page, and it’s the type of pillar page we’re focusing on in this guide. It’s a single page with comprehensive information about a core topic. The page is made up of your original content; you’re owned media. Tip: Since inbound links are a key benefit to a resource pillar page, develop an outreach plan to the sources you’re linking to so that they can link back to your pillar page. The best way to explain a 10x pillar page is that it’s an ungated content offer. What’s the quickest way to make a pillar page? Take an ebook you’ve written, deconstruct it and rewrite it so that it works as a single web page. The key is to offer the content as a gated download in addition to the pillar page content. The download has the same content as the page, however, “HubSpot did a study in March 2017, and found that 90% of website visitors prefer to read lengthy content in a PDF as opposed to a website page.” Even though a pillar page has all of the same information, you will still capture lots of leads from visitors who choose to download it! The advantages are that Google and other search engines will index the page improving your rankings and allowing your content to become the featured snippet for specific search queries. This will increase the number of people who find you pillar page, brand, and services. Of course, there are a lot of tips, and strategies on how to make pillar pages perform better for SEO, and for lead capture, but you get the idea. Topic clusters are the subtopics of the core topic covered on the pillar page. These subtopics are covered in a single section of the pillar page and will be published as one or multiple blog posts or other types of content. Each piece of content links back to the pillar page, helping search engines see the intent of the pillar page and building authority for it. The pillar page will also selectively link to your published content and external published content where it makes sense. Defining Topic Clusters and creating pillar pages can be daunting. For each pillar page, define keywords that are relevant to the core topics you wish to become an authority on. Then define subtopics for each core topic. How to Convert your Instagram Account to an Instagram for Business Account. Creating Posts that Resonate when Using Instagram for Business. When to Use Posts, Albums, and Stories when Using Instagram for Business. Converting Blog Posts to Albums when Using Instagram for Business. Creating Compelling Stories on Your Instagram for Business Account. How to Engage with Your Community with Instagram for Business. Using Instagram for Business Analytics to Optimize Content and Engagement. How to Advertise on Instagram for Business. 10 Tips for Growing Your Instagram for Business Account. We walk you through selecting core topics and subtopics in the section Define Pillar Page Topics. Audit the content you have such as blog posts, infographics, or videos, and any content offers such as ebooks, strategy guides, presentations, or whitepapers, or checklists. Figure out what content you have, and where there are gaps. Revise your existing content to fit the pillar page, and create any content needed to fill the gaps. We show you how to audit content and create a pillar page content strategy in the section Select Pillar Page Topics from Existing Content. As I said earlier, HubSpot is shifting their software and clients to this strategy. They introduced their Content Strategy tool in September of 2017 to help customers plan pillar pages. Now, they’re sunsetting their built-in keyword tool. While HubSpot is on the cutting edge of this shift, all brands should be moving to a topic cluster - pillar page structure for their content and website. It also has lots of other advantages for marketing teams. By creating a pillar page, you have to document your brand’s value proposition related to a specific core topic. That makes it clear for the world to see. That includes customers, prospects, internal sales staff, and executives. It helps marketing teams identify gaps in content, and makes updating messaging easier. By sunsetting the keywords tool HubSpot is forcing their clients to move to topic clusters and pillar pages, your brand should be making the move too! Text from their pillar page is the featured snippet, and links to their pillar page make up the top four organic search results! Typeform’s customer success guide. Typeform offers interactive online forms for customer feedback. GoodUI evidence page. Which shares information about which User Interface (UI) implementations get more conversions. Helpscout’s customer acquisition page. This addresses entrepreneurs early stage questions about how to win customers. More examples are being written about every day. Perform a search for ‘pillar page examples’ and review several for inspiration. The pillar page approach has benefits beyond SEO. Pillar pages tend to improve the quality of content because of the thorough planning that goes into creating them. To cover a topic comprehensively you have to perform gap analysis, then create any content needed to fill the gaps. This gives you a more comprehensive battery of content. It also makes it easier to make sure core messages are aligned throughout the content. Since it's a campaign, and since so much content is being created at once, it's easier to get internal subject matter experts to review content, and make sure quality controls such as copy editing take place. While this should always be the case, some organizations struggle with these content development issues. Doing all the content at once in a focused effort seems to help make those critical quality control steps happen. Beyond the core content covered on the pillar page, you will likely come up with a series of related topics that dive more deeply into specific subtopics or are tangentially related. This provides a content roadmap for your content team. Content for these topics can be created later and added to the pillar page and content offer if so desired. This content roadmap can help you keep the topic covered by the pillar page top of mind for your audience longer. While mileage may vary, we have seen faster content creation results when working on topic clusters and pillar pages from scratch. The singular focus and shared research that goes into writing a comprehensively on a single topic make it easy to break that topic out into several pieces of content. We’ve been able to produce the content offer, pillar page, and 15-20 high-quality posts in two-four weeks. That content can be promoted over eight to 12 weeks. By publishing a comprehensive amount of content all at once, you’re allowing members of your online community to binge your content. This is similar to binge-watching a Netflix series, but it’s not for the entertainment. When someone is interested in a topic, they tend to consume as much content as possible on the subject. They want all of their questions answered. By creating a comprehensive pillar page, you’re allowing them to do that with your content, on your site! We’ve found pillar pages make content campaigns, their goals, and objectives easier to explain to everyone. From the perspective of an agency, we find it easier to explain it to clients. Clients find it easier to explain to their management. From this point, the discussion tends to become very must about the 'nuts and bolts' of the project. We state how much existing content we can leverage with minor changes, how much existing content can be leveraged with significant rewrites, how much content must be created from scratch, and the time frame for completion. It’s a very common sense approach that’s easy to understand. Strong buyer personas are essential to compel action from your target audience. If you know the topic area you want your pillar page to cover, and don’t have any existing content to leverage for it, then selecting your pillar page topic will be easier, creating the content for it will take longer. Marketing goals should not be getting more likes and follows or about improving SEO rank. Like all marketing activities, your pillar pages should be helping your brand achieve the business goals set for your company in the coming year such as growing revenue, increasing sales to a specific market segment, or penetrating a new market segment. Because mapping marketing activities to goals is so important, we have you do this first so that you have your business goals in mind as your thinking of pillar page topics and associated topic clusters. We also have you do it again when you are selecting the core topics for your pillar pages. Specific: Discrete goals are easier to understand and focus on. Measurable: This will allow you to track key performance indicators (KPIs) to see if you're on track and adjust course if need be to hit the goals. Attainable: Your team must be able to realistically hit the goals. Relevant: So that marketing efforts are helping achieve your brand’s overall business goals. Time-bound: This identifies a defined period that you have to achieve the goal. Making sure the goals you defined have these qualities will help ensure the goals are meaningful to your business, will help your team focus on execution, and make tracking performance related to business goals much easier. What specific business goals will this pillar page help achieve over the next six, 12, and 18 months? How does it help achieve them? Since marketing and sales should be working closely together, we like to ask another question to ensure strong alignment with sales goals. How will this pillar page help achieve sales goals over the next six, 12, and 18 months? How does it help achieve them? While pillar pages are a part of your website infrastructure, and will likely continue to evolve, for planning and goal alignment purposes, think of pillar pages as a content campaign. That’s really what it is. You’re releasing (or re-releasing) a number of content pieces which link to a landing page (the pillar page you’re creating) and promoting both the pillar page and the related content to drive traffic, generate leads, and conversions. There is one notable difference between a traditional content campaign, and a pillar page campaign - the amount of content that is released with the pillar page. Many brands run traditional content campaigns by having 2-6 content pieces ready at the start of the campaign. They spread out publication and promotion of content pieces over each week, potentially publishing a new piece of content 2-3 times per week. This cadence generates awareness, drives traffic to landing pages, and keeps new content coming to maintain interest. They also may create and publish new content as the campaign progresses. To get the SEO benefit from a pillar page, it’s recommended that you have 15-20 pieces of content linking back to the pillar page right from the start. Moreover, part of the idea behind the pillar page approach is to allow for content binging. The same way viewers binge on Netflix shows when they are all released at once, pillar pages and the associated content allow your visitors to consume as much content on the topic as they want. This works well because, to cover the topic thoroughly, your pillar page should have enough content that 15-20 content pieces can be harvested from it. Maintain interest by providing a base level of promotion for each piece of content at the time of initial publication, then more broadly promoting individual content pieces over several days or weeks to maintain interest and keep the buzz about your pillar page going. To learn more about how to promote pillar page content see Publish, Promote, and Monitor the Pillar Page and Content. Insights: For many marketing teams, the amount of content to be created, the depth of that coverage, and the need to publish and promote at a base level is a big shift in what they are used to. Talk this point through with your marketing team so that they understand what needs to happen. With awareness of your business and sales goals, and knowing the amount of content you need to create or repurpose, you're in a great frame of mind to start thinking about core topics and subtopics. Core Services you provide. What services do you provide or products to you sell? Look at your website's 'solutions' or 'services' page for inspiration. Problems you solve or opportunities you provide. How do your services solve problems or create opportunities for your customers? Look at customer evidence like case studies, customer quotes, and recommendations for inspiration. Specific industries, verticals, or niche's you serve. What specific segment do you serve and how do you differentiate yourself from your competitors? Look at your website's 'industries' or 'clients serve' page or your list of clients for inspiration. Emerging industry needs or shifts. Is there a change that's happening or about to happen in your industry? Getting out in front of changes with great content and information to educate your audience will bring in leads and customers. Look at trending topics on news sites for your industry or use tools like Buzzsumo to find emerging trends. The sales team. Get a list of the top questions they answer. These answers may help you create a 'solutions' pillar page. The helpdesk team. Get a list of the most common problems they help customers solve. This also might be used as part of a 'solutions' pillar page. Ask your top clients. Ask why they chose you, or continue to work with you. These answers may help you build a 'why we're different' pillar page. Ask executives about company focus. Executives usually have a clear idea why the company is going a certain direction or investing in specific technologies. Ask them what and why. Their answers may be a jumping off point for creating either a 'solutions' or a 'differentiation' pillar page. Poll Employees. Employees talk to people. Customers. Friends. Family. Ask them how they explain the unique value your brand brings to the table. Again, the answers may serve as a starting point for either a 'solutions' or a 'differentiation' pillar page. At this point, if you aren’t selecting pillar page topics from existing content, and don’t have any existing content to review for inclusion or linking to the pillar page, skip ahead to Validate and Optimize Topics and Subtopics. If you have any existing content that may be used to create a pillar page or will link to the pillar page, we suggest you continue to the next section. A pillar page strategy isn’t just for brands using HubSpot, everyone can, and should use this strategy. HubSpot has created a tool called Content Strategy to help find and validate core topics, link content, and measure results. You can do the same thing with spreadsheets, and other tools such as SEMRush, Buzzsumo, and Fan Page Karma, and we cover how to do both, but for HubSpot users, this is a good time to introduce the Content Strategy tool. For non-HubSpot users, you may want to read this section as the tool can make pillar page topic selection, validation, and performance measurement easier. Click here to skip ahead and learn how to do this by Selecting pillar page Topics from Existing Content. Note that this is just a brief overview, we explain how to use the Content Strategy tool in detail during each step in the pillar page creation process. In the HubSpot interface Content Strategy in found in the Content Menu. Accessing the Content Strategy tool in HubSpot. Once you open Content Strategy, you’ll find a video introduction, and an option to create a topic cluster. Content Strategy tool first page. If you select to create a topic cluster, you need to add a core topic. Adding a core topic in the Content Strategy tool. The Content Strategy tool can help you find and validate topics. You can type in a topic and see domain authority and monthly search information. This allows you to see which topics you have higher domain authority for, and which have a large number of monthly searches. Topic research data in the Content Strategy tool. You’re dealing with keyword analysis here, so you’re going to want to pick keywords that you rank for now, or can rank for once content is published so it’s good to consider long tail keywords that better reflect your niche. For example, if you offer technical training, and cloud computing is one of the technologies you offer training for, you should check both the phrases ‘cloud computing,’ ‘cloud computing training,’ and ‘cloud computing classes’ to see what yields the best result. Having a higher domain authority in conjunction with a larger number of monthly searches is what you’re looking for. The Content Strategy tool also examines the content on your website and blog and recommends potential core topics for pillar pages. Content suggestions in the Content Strategy tool. Keywords used on your website. Keywords used on your blog. Website headers (H1 and H2 tags). Brainstorm subtopics at the same time you’re brainstorming core topics. That will help you focus your approach to content strategy for any topic you move forward with. Remember, when your pillar page is done, you should have 8-22 subtopics (22 is the upper limit of the Content Strategy tool at this time), and 8-22 related content pieces that link back to the pillar page. We recommend a minimum of 15 related content pieces. In the HubSpot Content Strategy tool, only one piece of content can be associated with a subtopic so you will have to create a subtopic for every piece of content you want to track with the tool. While you shouldn’t be linking content at this point, it’s important to understand the one-to-one relationship between subtopics and content pieces in the tool. Supporting content defined in the Content Strategy tool. We suggest picking more than one core topic variation so that you can perform keyword research on the different variations. You should validate and optimize each candidate topic and subtopic to select the best one. You’ll do that in the next section. For now, even though you may have your topic candidates selected, we suggest you read the next section which contains valuable information on auditing your content which can help you choose the best core topics. If you’ve used HubSpot’s Content Strategy tool to select pillar page topics, you may not need to perform all of the steps in this section, but it’s worth reading to make sure you find all the content associated with your pillar page and to help you define your subtopics. If you already have a content offer the covers a topic in depth such as an eBook, whitepaper, or strategy guide, you can leverage the content in that offer create a pillar page. Review all of your content if you’re doing a full content review to collect all possible content topics that might be turned into pillar pages. Review only a subset of content based on campaigns the content was created for if you’re creating a pillar page around the subject of that campaign. Review content created to promote a specific content offer if you’re turning that content offer into a pillar page. Review only specific pieces of content that you think may be related to a new pillar page that you’re essentially creating from scratch. Gather performance data to inform your decision. Group content into topic clusters. A content audit looks at the content published on your site pages, on your blog, and on your social media channels. The goal is to identify the topics covered by your content to see how your audience liked each piece, and to determine how it is helping meet business goals. Topics titles. This is your overall content topic list. Some content will roll-forward as-is into Topic Clusters, some may need to be revised, some may be discarded. Keywords and hashtags used in the content or in the promotion of the content. These are the keywords you’ve been using. They will inform the keywords used for your Topic Cluster. Social metrics such as engagement, mentions, likes, and shares. Conversion metrics such as traffic, leads, and customers generated. Page views for blog posts and page views for landing pages linked from blog posts. Call-to-action (CTA) clicks from content. CTAs might be URLs, buttons, or image CTAs. Conversion rate (the number of call-to-action or link clicks from content that resulted in a conversion). Landing page visits from content and social shares. Income attributed to the content. Based on your defined attribution model. You may not have all of this data, but you should do your best to discover as much of it as you can. Tip: HubSpot’s Content Strategy tool looks at keywords, blog topic categories, and page headers to find potential core topics. You should too! Insights: You should focus on topics that provide the best brand awareness through social engagement, mentions, likes, and shares, and that get the best results regarding traffic, leads, and customers generated! Tools like Google Analytics and HubSpot Marketing Hub can help you find this information. Tip: Use a spreadsheet to track essential information about the content your auditing. Once you’ve completed your audit, group content into clusters by topic. For each group come up with a core topic that encompasses the content in the group. Look at topic titles and keywords to help identify patterns. Remember, you need a group of at least 8 topics, and ideally 15 or more all using similar keywords. Ideally, you’d have groups of 15-20 topics, all using similar keywords that you can copy and paste to make your pillar page and content offer. Odds are, things won’t be that clean. Many end up with multiple groups of 3-6 topics that are closely, or distantly related. If that’s the case, examine these smaller groups of topics that are most distantly related and see if you think of a core topic to encompass all of them. You want your pillar page to have eight or more major subtopics, so if you can find eight small content clusters and figure out a core topic that includes all of them, then not only have you figured out your pillar page core topic, but your main subtopics as well! Planning cloud migrations. 5 pieces of content. Amazon Web Services. 4 pieces of content. Microsoft Azure. 4 pieces of content. Google Cloud Services. 2 pieces of content. Preventing cloud vendor-lock-in. 3 pieces of content. Securing cloud computing implementations. 4 pieces of content. Automating cloud administration. 4 pieces of content. Cloud administration automation tools. 3 pieces of content. You’d start with 29 pieces of content to build your pillar page. From that, you can combine them to create your pillar page content! Tip: In our template spreadsheet, we use column B to ‘pencil in’ core topic ideas and column C to ‘pencil in’ subtopic ideas as you document each piece of content we audit. After you’re finished, go through the list and see what holds together. Once again, make sure any core topics you’re considering for pillar pages align with your business goals. For more information see Reviewing Your Business Marketing Goals in the section Define Pillar Page Topics. Once you’ve decide on some core topic candidates, you need to find keywords that map to them. This is where this new approach building SEO rank with topic clusters pillar pages connects with old-school keyword research. The best keywords will have a good monthly search volume and be relevant to your business and the personas being targeted. Beyond that, you need to define related subtopics that are extensions of the core topic. Domain Authority: Domain Authority (DA) is a search engine ranking score which predicts how well a website will rank on search engine result pages (SERPs). Scores range from 1 to 100, with higher scores being better. To learn more see this Moz article. Monthly Search Volume: This is a measure of the total number of searches through search engines over a given time period, often the previous 12-months. These tools can help you find domain authority and monthly search volume. Tool: HubSpot’s Content Strategy tool provides both domain authority and averaged monthly search information. Compare your core topic candidates to see which your domain ranks better for, and has higher monthly search volume. Use a robust keyword tool such as the Google Keyword Planner or SEMRush to help you find similar search terms. These other search terms may be more commonly used and have better monthly search volume than your original keyword candidates. For example, if one of your core topic candidates was ‘cloud computing training,’ you may find that the term ‘cloud training’ has much higher monthly search volume. Choose the best performing candidates to be your core topic and subtopics. Remember, you want to find a keyword or phrase your target audience uses regularly, and that has good search volume that your domain can rank for. Tip: If you’re having difficulty finding core topics, identify keywords commonly used in your industry, local area, and by competitors, then refine the list to keywords that are widely used, and that illuminate the unique value your business offers or problems you solve. As with core topic keywords, you’re looking for keywords and phrases your target audience will use when searching for your products and services that receive a strong number of monthly searches on average. Tip: Also run subtopics through the Content Strategy tool, or another keyword analysis tool of your choice to see monthly search volume. Subtopics with better search volume will improve traffic to your pillar page. You’ve done a lot of research to this point, only a couple steps to go to make your topic selection and pillar page the best it can be. You know who your competitors are, take a look at the keywords they’re using, and the topics they’re talking about. Not only will this inform your final topic and subtopic selection, but it will inform how you’ll position your services and differentiate yourself when you write your pillar page content. Keywords they don’t rank for but should (which provides an opportunity to rank for those keywords). Social channels and promotion strategies. Competitors best performing content topics. Examining how your competitors are positioning their products and services can help you refine the content plan for your pillar page. You might choose to target an underserved audience segment or accentuate a specific service or value that differentiates your brand. SEMRush lets you analyze competitors websites, keywords, and ads. 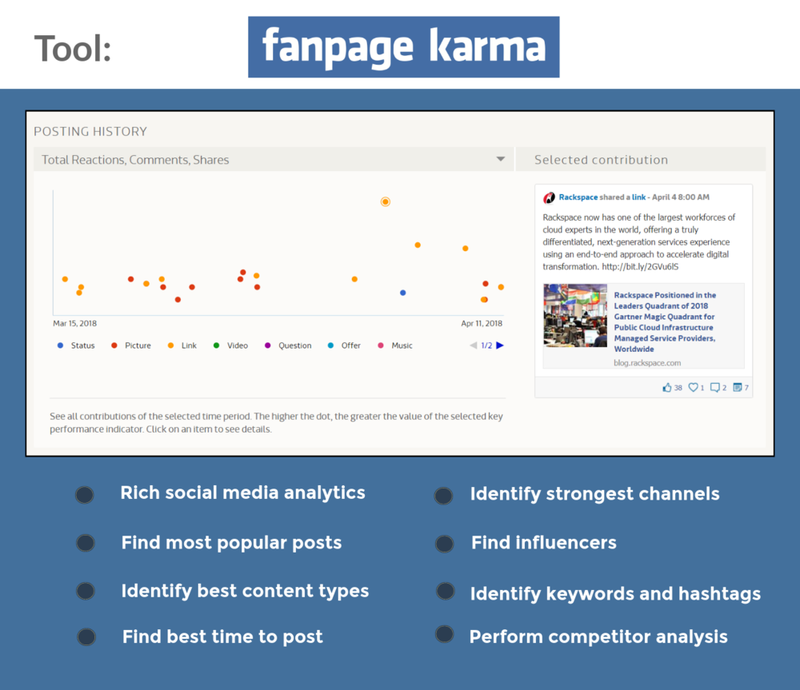 Fan Page Karma lets you analyze competitors content. In addition to looking at what your competitors are publishing, it’s a good idea to do a more general analysis of your industry. Both for topics that are driving conversation and interest, and for content published on the core topics and subtopics you’re considering. Buzzsumo is an excellent tool to find this information. Do content research by typing in the core topic and subtopic candidates and see what types of articles are being shared, and which are the most popular. After all this research you’re ready to select your core topic. Choose based on your keywords, and competitor and industry research. Do the same to identify 8-22 related subtopics. Now you’re ready to start creating the content that will become your content offer, pillar page, and surrounding content. That's a LOT of research. Get an Inbound Growth Plan and let us do the keyword and content research, the content audit, refine your personas, and give you content recommendations to get your pillar page development started! Identify any content you already have that can be leveraged for the pillar page. Identify gaps in content; this is content you will have to create from scratch. Update the content you already have. Assemble the content into your content offer first. Create the pillar page content. Have content editors and copy editors review all content. If you performed the content audit, you’ll have a good idea of the content you already have that you can leverage. Start with the content offer first, because that is the easiest to organize and format. The pillar page will contain the same information but formatted for the web and easier consumption. You should be able to pull individual content pieces directly from the content offer. Tip: Remember, people aren’t interested in what you’re selling, people are interested in solving their problems. Write your content to speak to their pains, and opportunities your products and services can help them realize! At a basic level, supporting content only needs a link to the pillar page. However, the link should make sense within the context of the content being presented. For example, in a blog post about the Top 5 Most Common Cloud Security Problems, you might add the following line, “We’ve created a comprehensive page that specifies the training your cloud team needs to avoid problems like these,” and link it back to the pillar page. 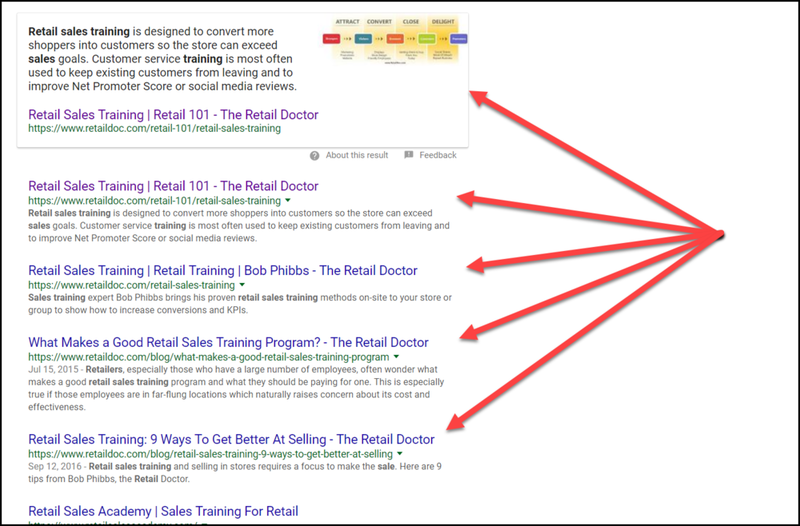 Align SEO to match the pillar page. Change the title, metadata, and URL to match the title of the subtopic in the pillar page. Create a 301 redirect to retain SEO from the old version of the post. Align messaging to the pillar page. Align any messaging, direction, and calls to action to match the pillar page and your brand in general if that’s changed. Make sure your guidance is consistent, and that you’re promoting the same offers in the same relevant places. Refresh the content. Check any URLs to make sure they are still valid and relevant. Update data from more recent sources, and update any graphics that have data. If you’ve developed a graphic theme you’re using on the pillar page, update graphics in the supporting content to match the pillar page. Make sure the word count isn’t too thin. Google tends to see web pages with small word count as being of little value and tends not to reward it. This is often referred to as the thin content penalty. There is much debate about this with people saying a minimum of 250 words is required, while others say 2,500-3,000 words provide the most benefit. Our advice, write for your reader and write something relevant and meaningful. Validate links to external content. You’ll get the greatest SEO impact from external backlinks if they come from sites with strong authority and from content that is determined to be valuable. As with your content, make sure the content is meaningful and relevant to the topic covered on the pillar page and try to link external content on domains with strong domain authority for your topic, subtopic, or industry. Linking to other high-quality sites will help your site build authority. IMPORTANT: Make sure you update the original content piece with these same changes so that everything is up-to-date, and aligned. A link to the pillar page from the subtopic content piece. Low word count on the associated content piece. A warning is displayed if issues are found. HubSpot Content Strategy tool warning that no link exists from supporting content to pillar page. In the case of this image, no link was found from the content to the pillar page, and the content contained a link to a domain with low authority. You can see this information once you link supporting content to subtopics, or when you link your core topic to pillar content. Break up large paragraphs into smaller paragraphs, even single sentence paragraphs. Break up text with spacing to make text blocks easier to identify and consume. For long-form content of any sort, use formatting such as headers with different fonts to identify key points, or when moving to the next section. For very long content such as a pillar page, add color to headers so that major topics and subtopics stand out. Combine this with bolding and even background highlighting to accentuate main ideas or facts. All of these strategies make your content easier to scan and consume. They also indicate the key points people should focus on in the text. Consider making lists into infographics.They provide a compelling visual that drives home key information, and they break up a text block making long-form content more interesting. 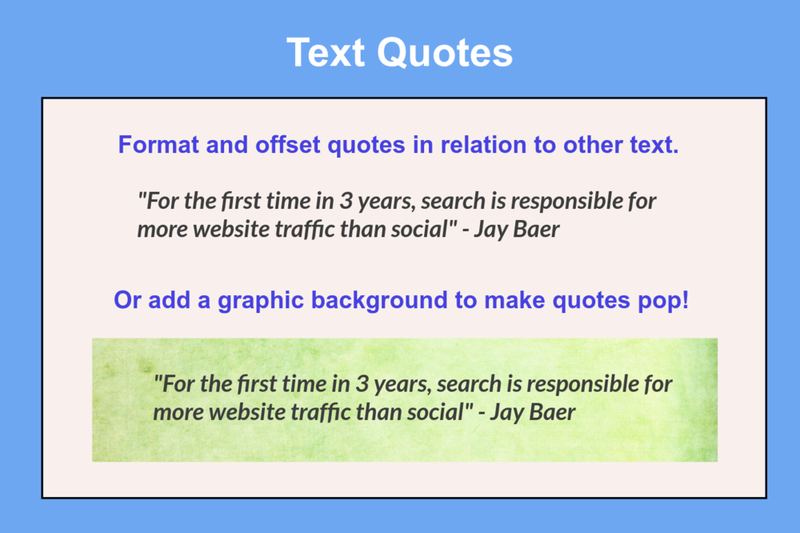 Quotes from articles and other expert sources are a great way to drive home key points and break up longer content. If you have ‘deep dive’ content that’s related to your main topics or subtopics but is too deep to be included on your pillar page, link to it. You can use a simple text URL or an image URL. If the content is popular, consider making it a gated content offer (See Think Through Conversion Points next). Always place calls-to-action near the most relevant text to make sure it makes the most sense in the context of the writing. Make sure the content is organized in a logically way so people can consume the content, and get their questions answered as they go. At this point have all content reviewed by content reviewers who have expertise in the subject area and incorporate any feedback or changes. Then have all content copy edited. Save the content as a PDF. This PDF will be a downloadable version of the pillar and will make up the primary content offer related to the pillar content. Make sure the PDF has a graphic image cover and branding throughout as well as URLs to your website and the associated pillar page. Tip: Include image calls to action linked to your landing pages for the conversion paths you’ve defined so that people can open your landing pages right from the PDF. As a separate menu item off of your services page. Create a teaser paragraph to put on the page that lists your services and link to the pillar page from a Learn more link. On the industry or vertical menu. If your pillar page is specific to an industry or vertical, have it reside on the Industries menu item. As a call-to-action on the Free Stuff page. Place a call-to-action linking to the pillar page on the same page where you list all of your free offers. Wherever you choose to place the pillar page, it should make sense in the context of your other web content. 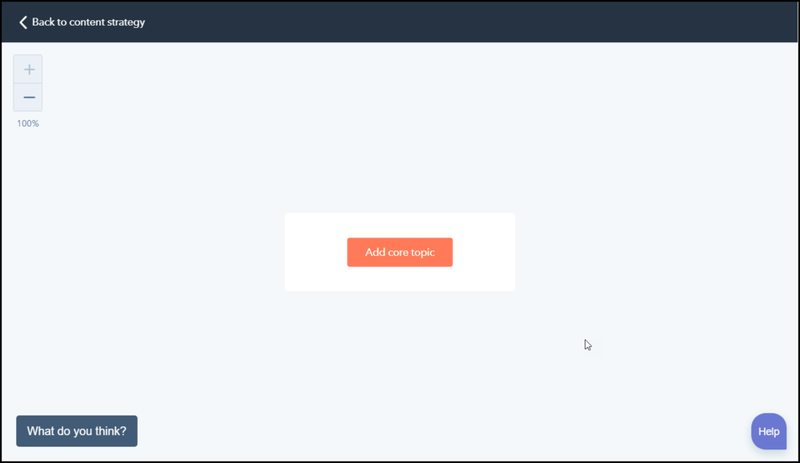 In HubSpot’s Content Strategy Tool, for the core topic to your pillar page, select the core topic and configure the Pillar content object. An existing landing page in the HubSpot CMS. Create a new landing page in the HubSpot CMS from this point. Link to an external page on your website hosted outside of HubSpot (such as WordPress). Once you save the link to the pillar content, the Content Strategy tool will validate that the URL page is accessible, and will validate the supporting content to make sure it is linked to the pillar page. If it is not, the tool will display an error. Now that the content and content offer is created, it’s time to add content to the pillar page. Since the content is already created, this may involve reformatting or reorganizing some content, or reorganizing it. We prefer to use the following format on the pillar web page. Tip: This is a web tip! While it’s a best practice to remove navigation menus from landing pages, we feel pillar pages are a bit different than a full landing page. We’ve looked at a number of pillar pages, and we see about 50% with navigation and about 50% without. We prefer to allow navigation due to the length of the content and, we believe, it gives us a little SEO boost. Your pillar page should start with a title and a one-paragraph introduction which explains the core topic you’re covering. Be sure to explain the value of the content from the perspective of the visitor. Speak to customer pains by clearly explaining the problems addressed by the pillar page content, and the potential benefits gained from consuming it. But, keep it short and to the point, Three or four sentences, like the first paragraph in a great novel. Follow the introduction with the content offer. Since you’re providing so much content, you want to let visitors know, right from the start, that they can download this content at any time and take it with them to read later. This offer portion of the page summarizes the benefits of the offer, shows a compelling graphic, and offers an easy opt-in form. Tip: Consider offering a bonus such as extra templates, formatted step-by-step checklists or some other bonus feature to add to the content offer to entice visitors to download. Some pillar pages use a website banner, such as a Snip.ly banner, to allow visitors to opt-in. While it’s more difficult to show the full value of the offer, many of them remain visible even as users scroll through the content. Tip: We recommend that you deliver the PDF through email as a best practice based on the recommendations in our article: 3 Insanely Easy Hacks to Improve Email Marketing Success. Follow the content offer with a Table of Contents (TOC) that links to the header text for the major sections of the pillar page content. Not every section of the pillar page will be of interest to all visitors, so you want to give people the ability to quickly find subtopics that interest them. With so much content on your pillar page, it can be easy to get lost. Don’t require visitors to scroll endlessly, provide Back to Top link or button at the bottom left or bottom right of each section of content. You pillar content will likely contain links to external websites or your own deeper content in blog posts. Have these links open in a new window so that you don’t take visitors away from your pillar page. Include a URL, button, or image calls to action throughout your pillar page content to link to relevant offers based on the conversion paths you’ve defined for your pillar page content. Always place calls-to-action near the most relevant text to make sure it makes the most sense in the context of the writing. Finish your pillar page with the same offer to download the pillar content. We also find that the end of the pillar age is a great place to offer any specific services related to the pillar page, so we recommend stacking calls-to-action. We like to use a button for the pillar page content offer, and a full image call-to-action for service-specific offers. Tips: If you’ve made some changes to the content for the web page version, have content reviewers and copy editors review the page one more time to make sure everything is right. Verify all links in the pillar page work. Verify all links to the pillar page from content pieces work. If using HubSpot, make sure the core topic, subtopics, and links to supporting content are in the Content Strategy tool. Google Alerts: Free, but less functional than many paid versions which can often monitor more social networks, blogs, and websites. Mention: Robust social monitoring, offers free and paid versions, good for daily monitoring. Brandwatch: Robust social monitoring, offers paid versions, good for daily monitoring. There are more robust tools like Simply Measured and Nuvi as well at higher price points. HootSuite: Free and paid versions good for monitoring Twitter. Many other social media management tools offer twitter monitoring. HubSpot: The Social Monitoring feature allows you to monitor your connected social media accounts and Twitter. 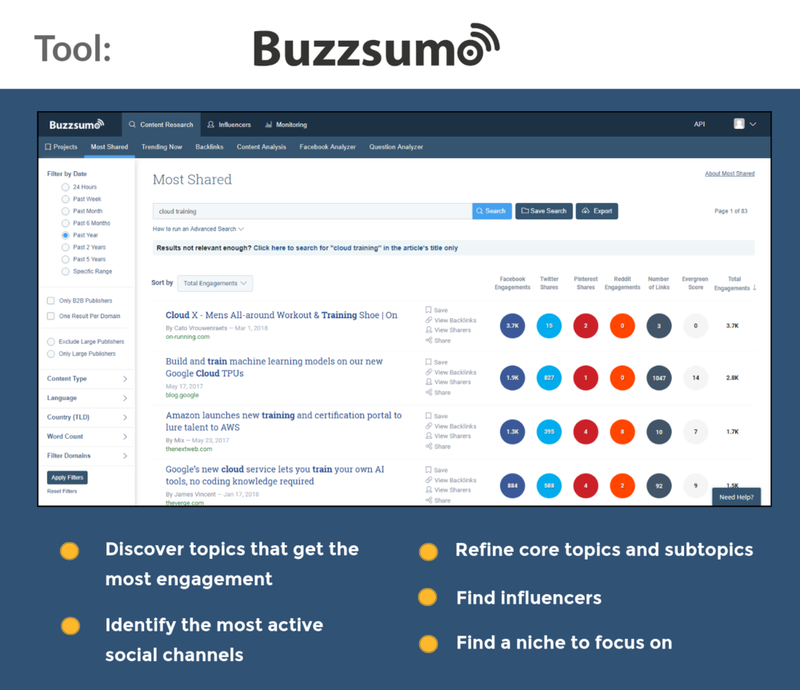 Buzzsumo: Monitors for brand and keyword mentions across Facebook, LinkedIn, Twitter, Pinterest, and websites. Mentions of your core topic keyword. Mentions of your primary subtopic keywords. Use mentions of your keywords as an opportunity to respond on the same social channel and provide additional value to those participating in the conversation by answering questions or provide links to additional information. Also look for patterns of mentions. If your core topic or subtopics are being talked about frequently on specific channels or by specific groups, share more frequently on those channels, and target those groups with information and promotions about your pillar page and related content. Social bookmarking sites are how many people search, find, and share content. All the content you share should be posted to social bookmarking sites when the content is published. Social question and answer sites like Quora are places that a lot of people go to in the hope of finding answers to their questions on a variety of topics. Depending on your industry, answering questions on these sites can potentially generate a lot of traffic and leads. The keys to getting traction out of Q&A sites is to be helpful by answering questions and to link back to your site for additional information and detail. In this case, you should link back to your pillar page. Tip: Buzzsumo (Pro-plus and above) provides a question analyzer feature which allows you find the most asked questions on a given topic. This can help you locate the best questions to answer on Q&A sites! If you have relationships with influencers, reach out to them to make them aware that you’ve published your pillar page. Don’t just send a link, make the case as to why it’s important to their audience. Give them data-backed evidence as to why it matters to their audience. Promote the pillar page when it’s final and published and all the initial content is linked. You’ll also create a schedule of continuous promotion to keep up the buzz about the pillar page. You’ll also publish each linked content piece at the same time you publish the pillar page, but you should stagger some promotion tasks for these content pieces to keep your engagement fresh and grow buzz around your core topic and pillar topics. We recommend promoting one or two pieces of content each week. After you do this broad promotion, also create a schedule of continuous promotion for each broadly promoted content piece. Tip: Use a spreadsheet or editorial calendar such as DivvyHQ or CoSchedule to plan and track promotion of the pillar page and each piece of content. Remember to keep curating and sharing good content about your industry on your social channels while promoting your pillar page! When the pillar page is published, and when you’re ready to promote each piece of content, share it on your social channels. Twitter: 10 times over two weeks. Six times in the first four days, and 4 times over the remaining six days. LinkedIn Page: Two times over two weeks on different days and different times. Pin the most current or popular post. LinkedIn personal profiles: For B2B pillar pages, have thought leaders from your company publish links one time on their profile. For popular posts, have them publish links again, one or two more times with a week between shares. Encourage employees to share once as well. Facebook Page: Two times over two weeks on different days and different times. Pin the most current post or popular posts. Google+: Two times over two weeks on different days and different times. Change each post a little to keep it fresh. Each time you publish, change the commentary or text included in the post or use a different image, or a linked image post with an overlayed quote, or a quote with a link back to the pillar page. For popular content that receives a high number of views and shares consider doubling or tripling your share rates on all networks except LinkedIn Groups. For LinkedIn groups, consider sharing popular posts only one or two more times with a week between each share. You want to keep all of your content out there and in front of your audience. Remember, as your audience grows, continuous promotion will help new members of your online community find your published content that most interests them. Use the same tips mentioned above to keep your continuous promotion posts fresh. Depending on the relationship you have with influencers that you engage with, notify them each time you publish a piece of content related to the pillar page. Again, be sure to tell them why the content is important to their audience. 42 steps. 18 Tips. Maximum Reach! Sessions: More sessions means more visitors. New Sessions: More new sessions mean you’re expanding your reach to new visitors. Average Session Length/Duration: The longer people stay on the page, the more engaged they are. Bounce Rate: These are visitors who come to your site and leave immediately. A lower bounce rate is better. Inbound Links: This number should grow over time. Contacts Created from the Page: This number should grow over time. Customers Created: This number should grow over time. You can monitor these metrics using Google Analytics and use a spreadsheet or other tools to map activities back to contacts and customers in your marketing and sales software. Domain Authority for the topic. This should grow over time. Monthly search volume. This should grow as you raise awareness and promote your content. Inbound links. The number of inbound links should grow and maintain over time as more people find your pillar page useful. Create new content that is similar to and supports content that is popular. Promote more popular content pieces more frequently. Identify social media channels, websites, and influencers that are generating the most traffic, and promote all content more aggressively to these channels and influencers. Refactor content that is unpopular based on lessons learned from popular content. Don’t forget to update the pillar page and the content offer if any of that content changes! SEO is constantly evolving, and your brand needs to evolve with it to get the best value from organic search. Developing pillar pages around topics clusters for the core services you offer and problems you solve will help you rank higher in organic search, and drive more traffic to your site. Through inbound marketing, that traffic will generate more leads and more customers for your business. Improves SEO rank for core topics related to your brand. Provides a strong content roadmap for your marketing team. Creating pillar pages can be a daunting task. SEO research, content research, content development, and effective content promotion are each technically difficult and time-consuming tasks. A properly executive pillar page campaign involves all four. If you’re new to pillar pages or don't have the time to do everything required, working with an expert may help ensure you get the desired value for your money. If you're ready, there's no time like the present. Download this guide as an ebook and get a bonus Content Audit Spreadsheet template! Simply fill out the form below.